TNR -- TV News and Reviews: Watch Hilarious Emmys Opening Monologue with Neil Patrick Harris, Conan O'Brien, Tina Fey, and More! 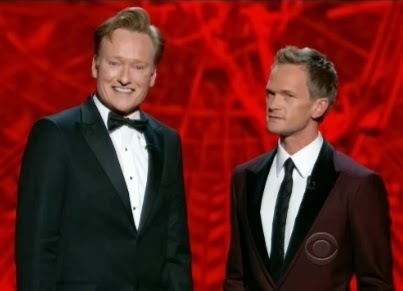 Watch Hilarious Emmys Opening Monologue with Neil Patrick Harris, Conan O'Brien, Tina Fey, and More! Emmy Awards host Neil Patrick Harris got off to a bit of a slow start Sunday night, with an awkward CGI scene of the "How I Met Your Mother" star interacting with a wall of TVs. Once he got to his opening monologue, however, things got interesting as former hosts of the Emmys interrupted his "flow." Conan O'Brien was a highlight, hilariously pontificating in a haughty tone about hosting two times "back when it meant something." I personally have to love a guy who adds as much snarky derision to the term "selfie" as it deserves. Check out the video of the whole sketch, where Kevin Spacey works his creepy magic and Tina Fey and Amy Poehler say what girls are really thinking about cute awards show hosts. Who was your favorite past host of the Emmys? Read more about previous Emmy Awards shows here.